Total Chemical ManagementUSP Technologies (USP) provides turn-key chemical management and full-service field programs to engineering firms and remediation technology practitioners using In-Situ Chemical Oxidation (ISCO) or other technologies requiring chemical storage and handling. USP programs have proven to be cost-effective and highly efficient using custom-designed chemical handling and management programs deployed by highly skilled field service teams. 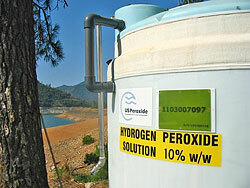 Soils contaminated with hydrocarbons (petroleum residues, solvents, pesticides, wood preservatives, etc.) present one of the more difficult challenges for remediation specialists. This is particularly true when the contamination has spread deep below the surface, making excavation costly or impractical. With ISCO treatment, a combination of oxidizers and activators are introduced to these areas via a well system to chemically oxidize the contaminants into mineralized products such as CO2, salts, and readily biodegradable organic fragments. This treatment method has proven to be less expensive, easier to control and can achieve more rapid results than some other conventional treatment methods. 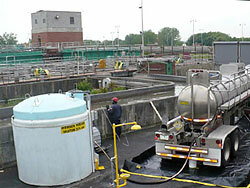 USP supplies a wide selection of oxidizers and activators for ISCO treatment with various packaging options available. Please note that this is a shortened list of our more common offerings, so please contact us regarding your specific application so that we ay tailor a chemical solution that meets your needs. Utilizing ultraviolet light and an oxidant is a proven technology for the treatment of environmental contaminants including MIB, geosmin, NDMA and various pharmaceuticals. Flow control equipment - flow meters, rotameters, dosing manifolds, splitters, etc. Heavy equipment - generators, forklifts, fencing, etc. Please contact USP for more information regarding all equipment offerings available and let us custom design and manage the handling/storage for your next remedial application. USP's consultative approach to problem solving includes performing objective customer "needs" assessments, applications assistance and development of chemical treatment programs tailored to a customer's specific requirements. Our full-service programs successfully implement the safe mobilization and demobilization of chemical storage and dosing equipment systems as well as staging and oversight of chemical inventory and supply. USP's highly trained field service technicians also provide ongoing field and technical support including daily JSA's, chemical blending/mixing, injection assistance and general project management throughout the application. This comprehensive operations and program management approach provides cost effective "hands-off" solutions to our remediation customers. 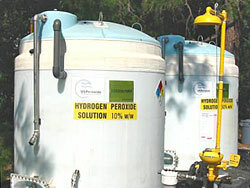 USP Technologies is uniquely positioned to rapidly respond to your environmental treatment challenges. USP combines experienced applications and equipment field support with a large inventory of storage systems and pumping modules to respond quickly to time sensitive soil, groundwater and wastewater treatment situations. Please contact USP Technologies for more information about our full-service programs so that we may determine which level of service is appropriate for your remedial application.